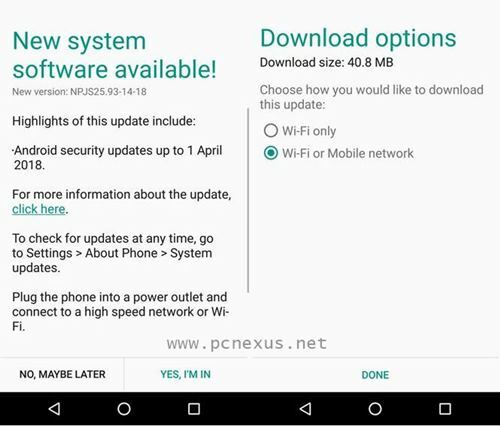 Moto G4 Plus has just received a new April 2018 security patch update with build number NPJS25.93-14-18. This update fixes Android security vulnerabilities up to April 1st, 2018. It doesn't bring any performance enhancements. So if you have got a notification on your Moto G4 Plus then update it. If you haven't received the OTA then you know where to check it. Just check the 'About phone>System updates'. The update is just 40.8 MB in size and takes 10 minutes to install. Make sure your phone's battery is charged to 60 percent at least. Last year in September 2017, Motorola announced that Moto G4 Plus will be getting android 8.0 Oreo update via a blog post. But it hasn't happened yet and that official statements is about 8 months old now. So I am sure about this that Moto G4 Plus won't be getting Android 8.0 Oreo update. Because on June 4, 2018 Moto G6 will be launched and the company may shift its interest from a two year old budget smartphone to the newly launched smartphone. So, if you are waiting for Android 8.0 update for Moto G4 Plus then your wait may go in vain. As there is no guarantee that the phone will receive its final major Android OS update. Till the time you can keep updating your phone with security patch updates.